The Arrow Head is one of our most familiar plants, quite as well known because of its beautiful arrow-shaped leaves as for its showy white flowers. It is interesting and conspicuous among the rushes and sedges that abound in the sluggish waters that border lakes and streams. It must have sunshine and well illustrates the words of Thoreau: " Rivers and lakes are the great protectors of plants against the aggressions of the forest, by their annual rise and fall keeping open a narrow strip where these more delicate plants have light and space in which to grow." 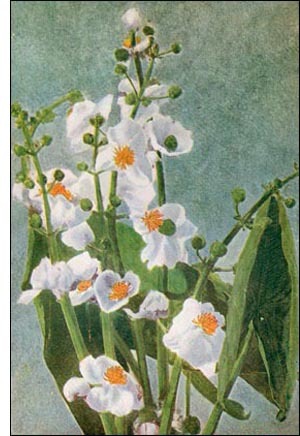 There are about twenty-five species of the genus Sagittaria, to which the plant of our illustration belongs. These inhabit both temperate and tropical regions. When the arrow head grows in water leaves are produced under water that do not have the arrow shape. These are not produced on those plants that grow on wet, muddy banks. Two kinds of flowers are produced by this plant-the male and the female. The male flowers are the large white ones with a golden center formed by the group of yellow stamens. The female flowers are lower on the flower stalk and are dull green and unattractive.